High Momentum Spectrometer (HMS) is going to have a bigger brother in Hall-C of JLAB called Super High Momentum Spectrometer (SHMS) to allow experiments to be conducted at 12 GeV. HMS and SHMS are basically a bunch of detectors stacked together to separate and measure various parameters such as energy of particles. Pions and kaons above 3.4 GeV are separated by heavy gas Cerenkov detector. The aerogel detector that we are helping build will be able to separate pions and Kaons below 3.4 GeV. As illustrated in Fig. 2, the aerogel detector will be placed in between S2 hodoscope and heavy gas Cherenkov detector. Aerogel detector construction is mainly supported by the National Science Foundation grant – MRI Consortium, which is a collaboration between Mississippi State University, Catholic University of America, University of South Carolina, Florida International University and Yerevan Institute of Physics. MSU is involved in characterizing the PMTs in the detector. The detector uses silica aerogel which was a part of BLAST experiment in BATES. The PMTs too came from BATES. The working of detector is pretty straight forward. The energy of the pions or Kaons going through the detector can be determined by the number of photons received by the PMTs and fortunately the voltage signal is proportional to the energy of a single particle in a PMT. 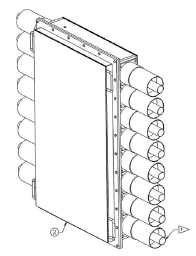 The SHMS aerogel detector shall be very similar to HMS Aerogel detector.